The Oregon foster care system has some serious issues. That isn’t news. But initiatives in the Oregon Legislature and within the Oregon Department of Human Services are attempting to address the problems that have plagued the system for decades. In the state legislature, the past several years have ushered in several reform efforts, often spearheaded by youth working with the Oregon Foster Youth Connection advocacy group. The newest statewide reform was passage of the Foster Sibling Bill of Rights in 2017. At the national level, the Family First Act, passed in February, is now being worked into state priorities. In her role as a child-welfare oriented legislator acting in a moment dubbed a “crisis” for foster care by the Oregon Secretary of State, Gelser has co-sponsored and chaired several new initiatives in foster care reform. Last year, the Foster Sibling Bill of Rights was signed into law. The legislation mandates the maintenance of sibling bonds after sibling groups enter care and was proposed by and lobbied for by the Oregon Foster Youth Connection. Gelser co-sponsored the bill. The Sibling Bill of Rights is still in the process of being implemented statewide, but the goal of that legislation is to put greater emphasis on keeping siblings who enter into care together if at all possible, and if a single placement isn’t possible, then to require that foster parents provide avenues for youth to visit and communicate with their siblings living elsewhere. When asked about how implementation of the law is progressing, Gelser said there is still work to be done to educate those who work in DHS and foster families about the necessity of maintaining sibling connections, both for the youths’ sake and for the sake of compliance with the law. It’s also important to note, Gelser said, that the Sibling Bill of Rights applies not just to foster families, but also to adoptive parents. Gelser is a mother of four children, two of whom are adoptees. She said understanding the importance of biological family is important even once the adoption papers are signed. Both of her adoptive children have contact with their biological families. One of her daughters, who was brought into the Gelser household under an open adoption, has had contact with her birth family throughout her life. Her other adopted daughter had a closed adoption, but just connected with her birth father through the Oregon Adoption Search and Registry. Gelser is also involved with the newest national foster-care reform legislation, the Family First Act, as chair of the Family First Implementation and Policy Work Group at the State Capitol. This act was signed into national law in February of this year, and will go into full effect in October 2019. This law reallocates federal funds toward preventative services for parents, and away from group foster care, which often produces unsuccessful outcomes for foster youth. The impetus of this law is that state agencies and childcare providers receive federal funding to take care of foster youth. Now that the law has been handed down from the federal level, state legislators need to figure out how to comply with it in their states. “Right now, that [federal] money can only be spent on foster care maintenance, but now we’re going to be able to use that money for prevention services, for parent coaching, for therapy, for substance abuse treatment—all the kinds of things that will help families avoid abuse and neglect and hopefully safely reduce the need for foster care,” Gelser said. The shift toward preventative services seeks to address the increasing number of youth entering foster care, which is a factor in the current “crisis.” If the state can do a better job of supporting families before they reach their own crisis point, then the state will not have to be the deciding factor in a young person’s future success. In addition to changing laws and policy, Gelser emphasizes the importance of community in supporting people in general, even if their children aren’t in foster care. The Oregon Department of Human Services, under pressure from a state audit and from years of unpleasant news coverage, is implementing major reform projects to better serve young people in Oregon foster care. Many of the 24 recommendations involve collecting better data about those who function in the foster care system—about the youth in care, about foster parents, about caseworkers, and when and why they burn out of their jobs. Paul Bellatty, Director of the Office of Reporting, Research, Analytics, and Implementation, is in charge of overseeing many of the data-collection efforts. The five research projects currently in progress are: utilizing predictive analytics to be more discerning about when to remove a child from their biological home; understanding the makeup of youth in the foster care system to provide better services to those youth; where caseworkers’ work can be streamlined; and recruitment and retention of both caseworkers and foster parents. The first project uses predictive analytics to better understand when a child should be taken from their biological home after a report comes into the child welfare system. Pairing employee judgement calls with data about how other cases similar to the one on the line have panned out will allow DHS to figure out which youth should be pulled from their homes. The predictive analytics should help DHS employees prioritize which youth are at risk when a child welfare case is reported, allowing DHS employees to focus on youth who are actually in need of state resources. The second project, which is currently in the process of reviewing 2500 child welfare cases statewide to better understand what types of youth who enter the foster care system and which types of foster care are in most need of state attention. The goal of that project is to understand what type of care is best for the types of young people in care. This project also analyzes the outcomes of different child welfare services to see which programs suit which type of family best, so families can be better paired with DHS programs. The third and fourth projects seek to ease the burden on caseworkers. The projects seek to collect data to understand where caseworkers’ time isn’t being utilized as effectively as it could, find the “optimum caseload” size for caseworkers, and to discover the factors that cause caseworkers to quit their jobs. To address the latter concern, DHS is researching whether the main problem is recruitment or retention: are the wrong people being recruited as caseworkers, or is there not enough support to retain good caseworkers? Or is it a combination of both? To answer to these questions, DHS will send out regular surveys to new and continuing caseworkers to find out what caseworkers need on the job and why those who choose to quit make that decision. That way, DHS can lessen turnover and create a better environment for caseworkers. The fifth project is about foster parent recruitment and retention. This project seeks to understand foster parent burnout, provide better training and services to foster parents to keep them in the system, and to recruit foster families that can better serve the needs of youth in the system. To learn more about DHS’s foster parent retention and recruitment efforts, see sidebar. All of these research projects are in progress, and all have concrete implementation goals to achieve once the research and data collection period ends. The goal isn’t just to horde data; the goal is to make the lives of children in the system better. “We’re going to do a better job of serving [foster youth]. Child safety is what it’s all about,” Bellatty said. The foster care system is like the youth it governs: perceived as broken, but really just in need of love and support and better adults. This is what I’ve learned over the past several weeks reporting on a series about foster care in Marion County. I’ve interviewed people within the Department of Human Services, current and former foster youth, foster parents, a senator who worked on care legislation, members of third-party agencies, and an advocacy group. I’ve interviewed stakeholders at all different levels of the system, and their message for you, reader, is this: They need you to care. They need you to care about these young people and what happens to them. I believe learning to care begins with looking into the eyes of individuals. It’s easy to read a headline about the foster care system and brush it off. What is that? That’s not a person—it’s a complex bureaucratic organism. There’s no life in that, there’s no humanity in that. So, we need to go deeper—don’t ask what is happening, but who is being affected? That’s a more interesting question. One of the most impactful conversations in my reporting was with a young woman who just aged out of foster care. Her name is Raven, and her story is the one I’d been anticipating and dreading since I began writing the series. Raven was abused in her biological home. After being removed at 8 years old, she was abused in several foster homes. She moved around too many times to count. She ended up separated from her siblings. She struggled with depression, bulimia, anxiety. For a while, she was homeless. There’s more to that story. But no amount of ink will ever make you understand how it feels to carry her pain. The point is: The system failed her. But it didn’t break her. Raise them up and teach them well. That’s what we need to do. And that’s not someone else’s responsibility, that is our responsibility as a community. An Oregonian headline published on August 1 reads: “Oregon anger management counselor, son accused of abusing foster children.” The details are familiar. The abuse took place over a period of time, and the appropriate officials didn’t catch it until recently. The comments from angry readers were predictable. Horrible monsters, how could this happen, the Department of Human Services (DHS)and Governor Brown fail children yet again. The outrage is both understandable and necessary. But it’s not enough. We see these headlines, pound out a caps-lock comment. And then we move on with our lives. We can’t do that anymore. These kids need better, right now. You don’t have to foster a child. But you can ask yourself: Can you be the better adult? On Tuesday, July 24 a group more than 30 current and former foster youth from around the state met at Willamette University and presented their policy recommendations on how the foster care system should change to better accommodate the needs of foster youth. Their audience was a cross-section of lawmakers, Oregon Department of Human Services administrators, service providers and community members. These policy recommendation presentations are the result of Oregon Foster Youth Connection’s (OFYC) annual Policy Conference. OFYC is a program of Children First for Oregon, and aims to empower youth to share their voices and provoke change in a system Oregon Secretary of State Dennis Richardson has declared to be in a moment of crisis. In terms of big-picture change, the goals of this conference are twofold: to let people who control foster care policy know what youth need from the system, and to lay the groundwork for the next long legislative session, when OFYC youth members will choose one policy recommendation to turn into a bill and lobby for at the Capitol. Giving foster youth access to policymakers is what OFYC and the policy conference are designed for. “We want to remove as many barriers as possible so they can share their voice,” said Lisa McMahon, program director of OFYC. The policy recommendations, which the foster youth spent the weekend hashing out, covered needed changes to foster care governance, including expanding mental health services, increasing funding for Court Appointed Special Advocates (CASAs) and prioritizing housing needs of youth at risk of becoming houseless. See sidebar onpage A7 the full list. But for foster youth, OFYC and the Policy Conference have a more immediate purpose: empowering youth right in the moment. Raven Sherrett has been involved with OFYC for four years. She’s been in the system since she was 8 years old, and now, at 21 years old, she just aged out of the Independent Living Program (ILP). In the past she’s attended Policy Conferences as a participant, but this year she was facilitating workshops and teaching other foster youth about policymaking. For Sherrett, the policy recommendations this year resonated with her own experience growing up in the system. One policy recommendation in particular hit close to home: a concerted effort to limit the number of “houseless” foster youth. At the conference, the youth who presented on this issue said foster youth need better information about their housing rights and should be more involved in deciding where they end up after they turn 14 years old. Foster youth are at risk of becoming houseless when they feel that their options are too narrow to accommodate their needs, whether that’s feeling pressure to exit the system because they feel they’re being forced into residential mental health treatment or can’t find an environment that accepts their identity, which is especially difficult for LGBT+ youth. Older youth who feel cornered often lobby to exit the system and end up homeless. “If you consider couch-surfing homelessness, and I sure do, I was homeless for about a year and a half. … Even though I’ve had places to stay, it was always temporary, it was only a month-long thing,” Sherrett said. This type of homelessness—where the individual isn’t physically on the street, but doesn’t have a place to stay long-term—often goes unnoticed. In addition to giving foster youth more information on and access to their housing rights, foster youth need more support to integrate into the community as they near adulthood. Another policy recommendation that addresses that need is increased funding for the Independent Living Program, which provides classes for current and former youth to better navigate adult life and funding for tuition, vocational training, and housing. State funding is currently set at $2 million, and the recommendation posits that $6 million is needed to allow the program to fulfill the current need. 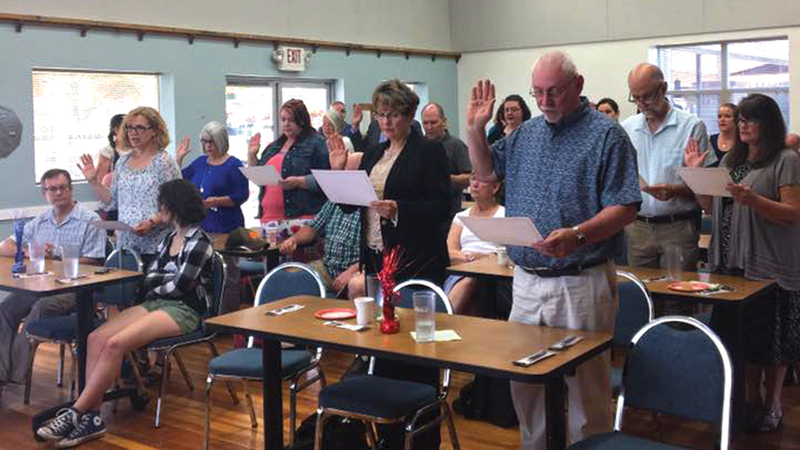 Sherrett’s passion for advocacy is evident, but the confidence with which she carries herself is something she’s had to work toward, she said. This year, as a workshop facilitator, she was coaching her peers on policymaking for the first time in her life. At first, she was anxious about filling that role. 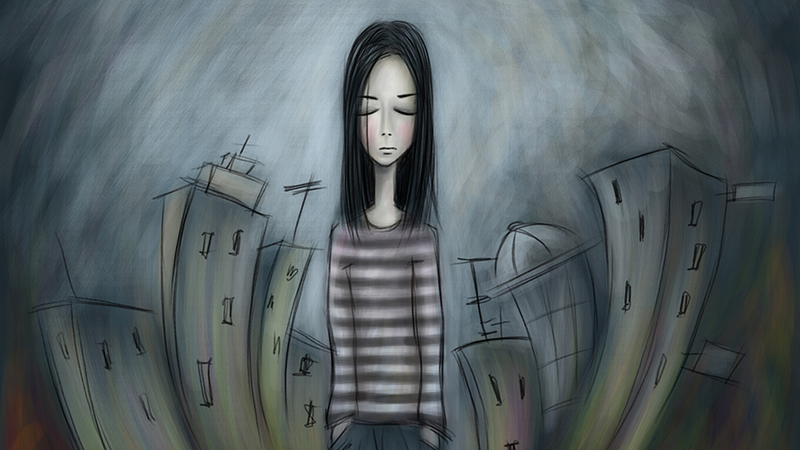 But after talking through her anxiety with some of her older peers, she realized the purpose of what they were doing. This is the sixth part of a continuing series in the Keizertimes investigating the state of local foster care and shedding light on ways to get involved. Every Child Oregon, a statewide organization dedicated to supporting foster youth through community engagement, is opening its Marion County chapter this month. CASA (Court-Appointed Special Advocates) of Marion County, 3530 River Road N., is now the local Every Child affiliate that will take on most of the on-the-ground implementation of Every Child’s goals in Marion County. CASA is already embedded in the foster care system as volunteer support for foster youth. Becoming an affiliate of Every Child will add another layer of engagement to CASA’s efforts of bettering the foster care system. “This includes providing opportunities for community members to engage; whether by meeting tangible needs or volunteering their time, offering a strong counter-narrative to some of the stereotypes associated with foster care, being relentless about foster parent recruitment, as well as seeking to offer support to existing foster parents,” Winterberg said. Shaney Starr, executive director of CASA of Marion County, said that engaging with Every Child will broaden opportunities community members have to get involved in the foster care system. Starr’s greatest needs in opening a local Every Child affiliate are twofold: volunteer power and donations, both in-kind and monetary. “It truly takes a village to make the system better. … I know there is a lot of work to be done, but I also know that we are blessed to be part of a very generous community. I can’t help but think about the quote from the movie Field of Dreams, ‘If you build it, they will come.’ I think we as a community are building something pretty great in Marion County, and I can’t wait to see where we go,” Starr said. According to data published by the National Working Group on Foster Care and Education in 2014, the percentage of 17 to 18 year old foster youth who want to go to college is 84 percent, but the percentage of foster youth who graduate high school and actually attend college is 20 percent, and the estimated percentage of former foster youth who actually attain a bachelor’s degree ranges from two to nine percent. The message is quite clear: foster youth have the motivation to achieve more, but not the support system. The take-away for many who work in this system is: We can do better, and we need to do better. But to make that happen, there must be community buy-in even among those who aren’t currently fostering any children. Slippy curates resources to support foster families, because the responsibility for fostering falls on more shoulders than just those who currently open their homes to foster youth. There are too many foster youth in the system and not enough adults to support them. This lack of engagement extends beyond actual foster parents, and into the support system that allows the foster system to function. Yet, foster parents and the Department of Human Services (DHS) cannot create the best environment for youth without the support of the community. This mindset of DHS is a new one. Billy Cordero, director of the DHS GRACE grant, seeks to use data known about children in foster care to recruit foster parents that are tailored to specific needs. “It used to be we were an organization that said foster care or nothing and we’re trying to change that,” Cordero said. Considering a youth who ends up in care is already steeped in extenuating life circumstances that impede their path to success, it’s important to acknowledge the ways the system can change a child’s life for the better, even if the situation is inherently not ideal. Cordero experienced foster care as a young person, due in part to his parents’ drug addiction. Cordero and his siblings spent some time in what he calls “orphanage-style care,” followed by a stint on the streets, before he was placed with relatives. “They were dedicated to me and they loved me,” he said. That changed his life. It wasn’t ideal — being born into a safe, loving environment to begin with would be ideal. But being placed in a safe, loving foster home gave him a second chance at success. After moving to Oregon from California to attend college, he learned “things don’t have to go the way the statistics say” for youth exiting care. Shelly Winterberg, the director of field engagement for Every Child Oregon, an organization that seeks to serve as a launch-pad for people wanting to get involved in the foster care system in any capacity. “We invite anyone and everyone to bring what they have to the table,” she said, whether that’s material resources, monetary resources or time. The Marion County chapter of Every Child is still in the process of being set up, but visit everychildoregon.org for updates. Burn out among foster parents is high, but burn out can be mitigated when they have the right support system, so they’re not doing it alone. Foster Parents’ Night Out (FPNO) is an organization dedicated to providing foster parents with a childcare break. Two FPNO chapters currently run in Marion County, based in the Salem Heights Church and Our Savior’s Lutheran Church, both in Salem. Organizations such as FPNO have been created by the community to fill that gap and support local foster families. Once a month, a host organization puts together a night of dinner and entertainment for all children in a foster home, whether they’re foster kids or the family’s biological or adoptive children. For four hours a month, FPNO allows foster parents to do “whatever they need to do to take care of themselves,” Cordero said. FPNO has been successful because the task of running the once-monthly events falls to the host organization, which is usually a church but can be a different organization, who provide the space, funding and volunteer power to make the program run. Prior to participating in an FPNO event, organizer host a a three-hour volunteer orientation covering the basics of foster care, how to interact with kids who have suffered abuse and neglect, discuss what the purpose of FPNO is, and what expectations exist for volunteers. Volunteers usually come from within the host organization, but unaffiliated community members can reach out to FPNO if they’re interested in getting involved with an existing chapter or starting their own. But the organization has other needs aside from volunteers, including donations and discounts on entertainment and catering. Local businesses and businesspeople who are willing to provide services to FPNO can reach out to the chapter they’d like to support directly. For more information on FPNO and getting involved, visit fpno.org. Court Appointed Special Advocates, or CASA volunteers, are meant to serve children who are often lost in a system that is overburdened and understaffed. In a courtroom, where a child’s voice can often be lost among competing adults, a “CASA volunteer is the only person who is there because they want to see the child’s voice heard,” said Shaney Starr, executive director of Marion County’s branch of the CASA organization. CASAs are foster youth advocates who are trained and sworn in by a judge to serve a foster child. The duties of a CASA involve reviewing the information in a foster youth’s case, spending time with the child, interviewing caseworkers, foster families, biological relatives, and making recommendations to the court on a child’s case to ensure foster youth have the best outcomes. CASAs may have different recommendations for the child’s welfare than caseworkers, lawyers or others party to a child’s case. Because CASAs report directly to the judge, and have an average caseload of two foster youth, their perspective on a case differs from others party to the case. While “respectful communication and professional interaction” between CASAs, DHS, and other parties is a priority, there are times when a CASA will make different recommendations to a judge about how the child’s emotional, medical, and educational needs are met. CASAs must have “a belief that every child has a safe and permanent home where they can thrive and the willingness to see that through,” Starr said. For these reasons, being a CASA is a two-year commitment, and if the foster child’s case stays open longer, CASAs are encouraged to stick with that case. CASAs provide oversight in a system that has come under fire for a lack thereof in recent years. Unfortunately, there are currently not enough CASAs for every foster child in Marion County. As of last count, there were about 130 Marion County CASAs and over 600 kids in care. At the currently number of foster youth in the system, the Marion County CASA branch needs an additional 75 CASAs in order to make sure every foster child has a CASA volunteer working on their case. For more information on training and getting involved as a CASA, visit casamarionor.org, email [email protected] or call 503-967-6420. The Department of Human Services has a long list of material needs and service opportunities for those seeking involvement. Smaller scale material needs include toiletries, new clothing, gift cards, and safety equipment like fire extinguishers and carbon monoxide alarms, for foster parents to install in their homes and meet DHS requirements. New car seats are also on the high-need donation list for DHS. For those who may not have the resources to donate materials, DHS also facilitates direct service opportunities, like volunteer transportation for youth to get to appointments, making a meal for a foster family, and office buddies, “who come and sit with children, in our office, while they are waiting for a placement – so workers are able to get time sensitive work done for the removal,” Slippy said. Volunteers of this type can help fill the personnel gap and allow DHS workers to be more effective at their jobs, while also making sure youth get the attention they need. In addition to these ways of getting involved, DHS welcomes new ideas from the community. “If people have service project ideas, they are welcome to share them with me and we can see if it would be a good fit for the agency,” Slippy said. Jessica Ratliff had five kids in her home: four of her own, and one foster baby. Then a Department of Human Services (DHS) worker called: Can you take a foster sibling set, two kids under the age of two? “How many people have you called?” Ratliff asked. Twenty-four people. Ratliff was the twenty-fifth. Ratliff said yes, for the meantime. “When you tell me you’ve called 24 other homes, I can do it, but I can’t do it for long,” she said. Foster families often have to provide short-term care while DHS workers find suitable long-term placements, often outside of Marion County. Ideally, there would be open foster homes available for immediate long-term care, but that’s just not the case. There are too few foster families and too many kids in foster care. Foster parents usually show up in the news for the wrong reasons: abuse, mismanagement of the foster stipend, and so forth. But the cameras don’t show up to document the foster parents working hard and doing the best they can for the kids that come into their care. “I think because there’s such negativity in the press around foster care lately that no one wants to go get involved with it. When all you see in the headlines around it are scandals and abuse, people don’t want to sign up and do that,” Ratliff said. But that’s not the mindset the community needs. “If people don’t like what they see on TV about foster homes, they need to step up and be the good foster homes. We just need people to step into that role and give these little children what they need,” she said. Ratliff and her husband opened up their home to foster youth just under four years ago and have generally fostered kids under the age of four. They’ve taken in about eight long-term placements and many more short-term placements over that time. “It’s the hardest, best thing we’ve ever done,” she said. But foster parenting isn’t a task to be taken on lightly. Foster parents need to have a love of children, but they also need more than that—a willingness to stay with a child even when the going gets tough. Shane and Malia Witham have fostered 24 kids over a period of six and half years. Malia and Shane also have three of their own “forever” children in the home, in addition to the children they foster. But they don’t usually make this distinction when they have a foster child in the home: “We’re not babysitters, we’re parents,” Shane said. Foster parenting is a task that requires the involvement of one’s entire community—not just those acting as foster parents, but also their own kids, their extended families, their circle of friends. “It’s a family affair, it is not just my husband and I, because it changes the entire dynamic of our home,” said Malia. Incorporating foster kids into the dynamic of one’s home requires acceptance of the children as they are, not as one would like them to be. This requires adjusting one’s expectations of behavior. Kids who come into one’s home from somewhere else are often used to different routines, and in the case of kids coming into foster care, these routines often aren’t ideal for the children’s age group. Ratliff described a one-year-old she fostered who threw his food on the ground when she put him in a high chair for snack time. Usually when a small child throws their food, Ratliff said, it means they’re done eating. But when Ratliff took the child out of the chair, she saw him trying to eat off the floor. She realized he was throwing food because he wasn’t used to eating in a high chair. “He wasn’t done, he wanted to eat in a more comfortable environment,” she said. Especially when working with young foster children, who can’t yet articulate their needs, listening to behaviors and adjusting one’s sense of a “normal routine” accordingly is important. As opposed to forcing the child to eat in a high chair immediately, she tried to find safe, but less restrictive places in the kitchen to feed him. “Their worlds have been flipped upside down,” she said, just by coming into care, so one shouldn’t force change too quickly. “Over time, we gradually work on that to get them to healthy, scheduled routines that are appropriate for their age,” she said. Malia noted that while fostering is truly challenging, the impact a foster home can have on a child is immense. Throughout our conversation, the Withams referenced a sibling set of three who lived with them for two years before moving on to live with their biological relatives a year ago. They still keep in touch and provide respite care for the kids on occasion. The three kids came to the Witham household with high needs and intense behaviors, but over the course of the three years they’ve known those siblings, they saw how their supportive environment allowed the kids to grow. One of the most challenging parts of being a foster parent is letting go and saying goodbye to the foster kids, especially when they’ve been in the home for an extended period of time. And that’s often a reason people cite for not becoming a foster parent, because it would hurt too much to give up a child they’ve developed a bond with. But foster parents are supposed to get too attached. That’s part of their job. To find out more about becoming a foster parent, adoptive parent, or short-term respite care provider, visit MarionFosterOrAdopt.com, where you can contact local foster parent certifiers. When was the last time you felt safe? Really, truly safe. The kind of safe where you can trust those around you. The kind of safe where you weren’t worrying about where you’re going or if your family is okay. The kind of safe where you were completely, totally, utterly relaxed. Do you have an answer? Have you ever had to consider the question? “Am I safe?” is a question thousands of kids in foster care around the country have to answer for themselves every day. Erma Brundidge is very familiar with this question. After working in the Department of Human Services for almost 20 years—a journey which began with being in foster care herself as a child—she’s both seen and experienced how the lack of safety can impact one’s life. “Our [foster] kiddos are not able to relax because they’re always on guard. … I share with them, it is rare that I am ever fully relaxed. It’s from being in the system and on my own and not safe for so long. It’s in here. I’m always watching my back, are you going to trick me? It’s locked in,” said Brundidge. This pervasive sense of unease, of imminent danger regardless of whether there is any, is a result of traumatic experiences children in foster care endure, both before entering the system and after they come into DHS custody. Foster kids are constantly asking themselves and their guardians—am I safe? Unfortunately, the answer is often: no. As a significant number of children come into the system because they’ve been abused or neglected, that’s the answer they received from their biological parents. But even after they come into care, the negative behaviors kids develop to cope with a constant answer of “no” cause foster kids to be moved around. A lot. Only 57 percent of kids move placements one or two times over the course of their time in care. 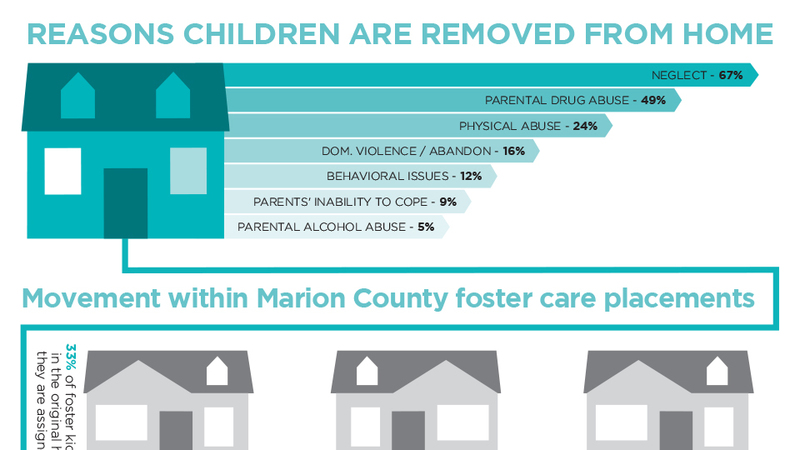 At the other end of the spectrum, 22 percent move more than five times, according to Marion County foster care data aggregated by the University of Kansas. Brundidge spoke about the seven levels of safety—one feeling safe in public and seven feeling completely at ease all the time. The fourth level of safety is “Am I safe even if I provoke?” This is often a difficult question for foster parents to address, because provocation as a gauge of safety is one of the negative coping skills traumatized kids develop to test their environment. “And that’s what they get an answer of no to all the time,” Brundidge said. Traditional DHS foster homes often aren’t equipped to handle kids with acute trauma experiences, who have developed negative coping skills to handle their sense of trauma. When a kid is found to have a severe enough emotional or behavioral problem, they’re often referred to agencies that contract with DHS to provide therapeutic homes for foster kids. 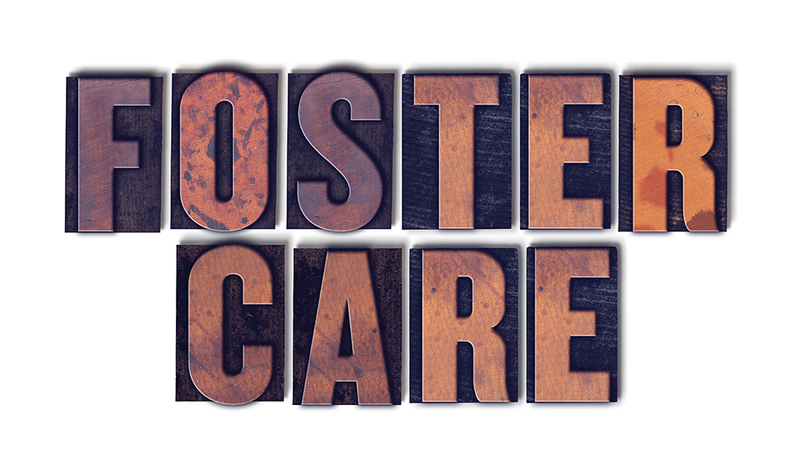 Therapeutic foster care is known as “treatment level” for kids who have been designated by DHS as in need of Behavior Rehabilitation Services (BRS)—essentially, kids who need more than just a stable home environment to heal from their experiences. Therapeutic foster homes receive special training and accommodation to deal with the needs of traumatized kids who haven’t learned to cope with their trauma. Trauma is difficult to quantify in a person’s life. However, the Adverse Childhood Experiences Study (ACES) aims to measure the level of trauma a person endured before their eighteenth birthday in a series of 10 yes-or-no questions: whether they were physically, emotionally, or sexually abused, whether they were neglected, whether their parents used drugs, suffered from a mental illness or were generally absent. Every “yes” answer adds a point to the ACES score. According to an ACES survey of youth in children’s programs in Oregon, over 90 percent of the youth served in therapeutic foster care have an ACES score of 4 or higher. When children endure trauma without respite—which is what the average ACES score suggests happens for many kids who end up in treatment care—their brains develop in a way that inhibits self-control. These neurological problems result in severe behavioral problems. “These kids are in treatment really because of the significant issues they’re having. Our job is to stabilize them, get them evaluated, and see if we can get them settled down to be able to go down to a lower level of care, or go home if they have a home,” said Debby Lute, executive director of Connections365, a therapeutic foster care agency based in Salem. Connections365 typically works with kids ages 12 to 18, and currently works with eight certified families fostering 12 kids in the Salem area. Therapeutic Foster Care (TFC) agencies use the guidelines of the DHS foster parent training, but include additional elements on caring for traumatized kids, how trauma impacts brain development, and how kids use negative behaviors to communicate when trauma has impacted the way they think and see the world. Aside from special training for foster parents, TFC agencies employ mental health counselors and mentors on staff to provide the most support for kids, as well as around-the-clock on-call support for foster parents. “If you think about treatment foster care, [the foster kids] are part of a wraparound team,” said Lute. This team includes the foster youth, the foster parents, the caseworker—also typically an employee of the TFC agency and not DHS, so they have a smaller caseload—the mental health counselor, and any other individuals party to the child’s case, including biological relatives, or necessary for the youth’s recovery, including outside drug or alcohol counselors. Due to an increased number of youth in foster care who need this specialized treatment, and the intensification of youth behaviors in recent years, the need for therapeutic foster homes has expanded. However, in terms of homes, “the system is compressing right now,” Lute said. This is particularly tough on childcare agencies, considering TFC homes can’t take as many children per home as general foster care—in TFC, single parents can have up to four kids in the home, including their biological children, and couples can have up to five kids total in the home, a reduction from the norms for traditional foster families. Brandi Ware is the therapeutic foster care supervisor at Maple Star Oregon. Maple Star is a childcare agency based in Portland, which serves youth ages 6 through 21 living on the I-5 corridor between Portland and Eugene, including Marion County. Ware said that they serve about twenty youth in their TFC service range, and they are currently at capacity—but she still receives 50 new referrals for BRS youth every month. “A lot of them I have to say no to because we don’t have the beds,” said Ware. A lack of treatment care opportunities for struggling foster youth can have consequences down the road. The importance of treatment intervention, Jessica Carpenter, Connections365’s Community Outreach and Development Director, said, is that TFC agencies are “the last chance for these kids before they are adults and everything they do is a permanent criminal behavior and effects their ability to get a job, have a place, get a car, become a parent.” Providing these services to all the youth who need them is essential, but there aren’t enough therapeutic foster homes to serve every youth who could benefit from treatment care. The cyclical nature of dysfunctional parenting techniques, incarceration and substance abuse concern those who work in this field—disrupting this cycle is the goal of treatment care, so as this generation of foster youth age out, they can become better parents, healthier individuals, and more productive members of society. Unfortunately, when there’s not enough resources to provide treatment for every youth, they’re likely to fall back into the negative cycle from which they came. Most importantly, they need parents who can give kids a better outlook on life and open up the opportunities that have been closed off to them by their circumstances. “[Youth] have to have hope. And hope is not built on their failures and their mistakes and their behaviors, it’s built on their capacity and their resilience,” said Lute. Connections365 hosts open-house informational sessions for parents interested in either long-term fostering or providing short-term respite care. Tuesday, July 24, 4:30-6 p.m., 4890 32nd Ave S.E. in Salem. Tuesday, August 28, 4:30-6 p.m. 4890 32nd Ave S.E. in Salem. Two weeks ago, three siblings came to the Department of Human Services Child Welfare Office for foster placement. Immediately, several Child Welfare staff began trying to find one foster home for all three kids, because sustaining remaining family ties is a priority. Other work was cast aside, and they spent an entire day searching for a placement. “We ended up separately placing them in three different homes and out of county,” said Gwen Slippy, Marion County’s Foster Parent Recruitment, Retention and Training Specialist. No Marion County foster homes had the space. This is a day in the life of the DHS Child Welfare Office. As of the latest DHS Child Welfare count, there were 603 kids in foster care in Marion County. 204 of those kids are in “child specific” homes, meaning they’ve been placed with certified relatives or with other people in their lives who certified their home for fostering. That leaves the remaining 399 children to be placed in 77 general-certified homes—an average of about five foster children per home. According to DHS policy, single foster parents may have up to four children, including their biological children, in the home. Couples may have up to seven children in the home. Due to an extreme shortage of certified foster parents, these higher numbers are the new normal for those fostering. The system has not always lacked so many foster homes. In the early 2000s, when Oregon was suffering from a methamphetamine epidemic, thousands of foster children entered the system all at once. For several years, over 1,100 children were in care on a monthly basis in Marion County. DHS orchestrated a huge push for foster families, and the community came through. But after that push, many of those foster parents adopted their foster children, and subsequently stopped opening up their homes to new kids. Brundidge has held different roles within DHS Child Welfare for almost 20 years, and she’s seen a shift in the kids arriving in care. Behavioral problems among children in foster care have intensified in recent years. While Brundidge isn’t sure of the cause, they know that the kids who come into care “require more time and energy and skill level” from foster families, Brundidge said. Foster families can rise to the occasion of dealing with difficult behavioral problems, but they must have the “desire to learn those skills and can invest some time upfront,” she said. This is why all foster parents, regardless of whether they’re related to the child, must complete foster parent certification training. For initial certification, foster parents must attend a set of eight, three-hour sessions, which cover everything from working with a child’s biological family to child development to sexual abuse and trauma and how those circumstances impact a child’s behavior. On top of these classes, DHS requires an additional six hours of trainings to become certified. These additional trainings can take the form of DHS-offered classes in topics like extreme behavioral issues and how to deal with the grief of saying goodbye to a child who’s been in the home for a long time, but training hours can also come from attending counseling sessions with a foster child or reading books specific to the child’s case; these details can be worked out with one’s certifiers. After initial certification, foster parents are asked to complete 30 hours of training every two years for re-certification. Aside from formal trainings, Slippy and Brundidge are dedicated to receiving foster parents in their office and working through issues together. This is part of DHS’s effort to change the culture within the agency after the recent state audit of the foster care system. “Our new DHS director and Child Welfare director are helping the culture of our agency to shift, in that this is a service agency and when you serve people you serve each other and serve in a bigger picture,” Slippy said. For more on DHS’s response to the recent audit, see side bar. Just like a new parent, foster parents need support from those around them. Slippy and Brundidge emphasize the role of the community in creating successful foster homes. There aren’t enough foster parents but there also isn’t enough support for current foster parents. There’s a role for those in the community to play, whether that’s in babysitting or transportation of the child when the foster parents to attend an appointment or in moral support when a foster parent is struggling to cope with a new child. “If [community members] can’t have the child in their home, they could help support a family by bringing in a dinner or any of those simple things,” Brundidge said. In addition, recasting the role of the foster parent as a community service is important. Community members should acknowledge how much dedication it takes to be a good foster parent. “I honestly believe if we can have a mentality of thankfulness and acknowledgement, we could go far beyond reaching out and getting foster parents,” Brundidge said.